He disclosed that President Muhammadu Buhari was not aware of Onnoghen's arraignment and that the president would not interfere. "President Muhammadu Buhari's own approach is that institutions should just do their work. I can tell you, for a fact, that the president didn't even know about the issue until Saturday evening. The president has said categorically that no one should interfere in whatever the institutions are doing," said Osinbajo. The vice president, who is a Senior Advocate of Nigeria (SAN), said: "In my case, I would rather not have a situation where senior members of my profession would be tried for an offence. I don't feel particularly good about it. I feel very sad. But that is my position on it. However, this is the way it works." But the Peoples Democratic Party (PDP) and other opposition parties dismissed Osinbajo's claim that Buhari was unaware until Saturday. The PDP particularly challenged the vice president to explain why Buhari did not stop the arraignment on Monday or say anything on the matter since. "If the avowal by Osinbajo was true, then it goes to confirm the assertion that Buhari is not in charge of governance but has outsourced the responsibilities of his office to unelected individuals due to his incompetence," it said. The Coalition of Opposition Political Parties (CUPP) in a statement claimed it was "in possession of evidence of meetings and call records of APC chieftains behind the ongoing attempt to force the CJN out of office." It added: "With the happenings in the last 48 hours and the insistence of the presidency to either get the CJN to comply or be removed from office, we hereby notify the nation that the life of the Honourable CJN, Justice Walter Nkanu Onnoghen, as well as those of his family members is not safe. "The situation will very quickly descend into compromising the security of the CJN. The APC government views the resistance of the CJN to the plot to hijack the Supreme Court as the only piece that has not been fixed in its grand design to rig and manipulate the 2019 general election for President Muhammadu Buhari and APC chieftains." Also, former Ekiti State Governor Ayodele Fayose said: "It should now be clear to Nigerians that President Muhammadu Buhari is not in charge of anything. He might not even be in charge of his existence, not to talk of being conscious of his position as the president of Nigeria. "Is the vice president saying that the minister of justice can unilaterally file charges against a high-profile government official like the CJN? What the vice president just told Nigerians is that the government is truly under the firm control of the cabal that the First Lady, Aisha Buhari, said Nigerians should rescue her husband from." But chairman of the Presidential Action Committee on Anti-Corruption (PACAC), Prof. Itsay Sagay, backed Onnoghen's arraignment at the CCT, faulting calls for the CJN to be examined by the National Judicial Council (NJC). In a statement, he argued: "Some Senior Advocates of Nigeria have argued that even in a case involving the breach of the Code of Conduct, for which the law has already made express provisions, the matter shall be taken to the NNJC rather than to the CCT. They can't be serious. They must obviously be speaking tongue in cheek. Even a baby, three months old, must realise that no one can get justice against the CJN at the NJC. "The CJN is not only the chairman of the NJC, he is also the appointer of 20 out of the NJC's 23 members. The CJN is the NJC. Only a grossly ignorant man or an extremely dishonest one could seriously suggest that a matter involving the CJN should be brought before the NJC for adjudication. Therefore the whole idea of taking the present case to the NJC is a nonstarter. That would make the CJN the chief judge of his own case; a clear violation, not only of the constitution, but also of a long-standing common law principle coming all the way from Magna Carter in the year 1215." In added: "Why is Nigeria always a theatre of the absurd? Today, we are only talking about preliminary objections, interim injunctions, challenge of jurisdiction, wrong procedure, etc. Nobody is talking about the substantive issue any longer. That is now lost in the sands of time. Did he do it? Did he not do it? The questions we should all be asking are: Did the CJN fail to submit a written declaration of all his assets and liabilities within three months after being sworn in? "These are the substance of this case, which is deliberately being abandoned by the SANs and some other Lawyers. Nigerians should not allow themselves to be distracted by this vicious and dishonest campaign intended to sacrifice the substance of this case on the altar of technicalities. The truth must not be the first casualty in this matter." The Buhari Media Organisation also insisted that corruption must be fought at any level. "It is important to remind Nigerians that this chief justice is the same person who had, in a statement credited to him, said that wherever Nigerians saw corruption among judges they should call it out. As long as he has nothing to hide then the law should be allowed to take its course, and this should be the mindset of all Nigerians," the group said in a statement by its chairman, Niyi Akinsiju, and secretary, Cassidy Madueke. It noted: "This same chief justice has sat down on cases bearing on the declaration of assets by public officials. He had declared some wanting and set others free (like he did to the senate president). So, what is there if he subjects himself to the same procedure he has subjected others to? 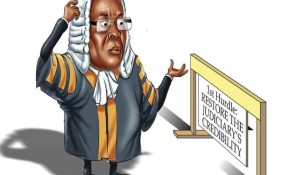 Moreover, for the sanctity of the profession and respect for the judiciary, we would have expected that the chief justice step down after admitting to making such a profound mistake that casts doubt on his integrity and honesty."